If you're going to drink coffee, head somewhere truly interesting. 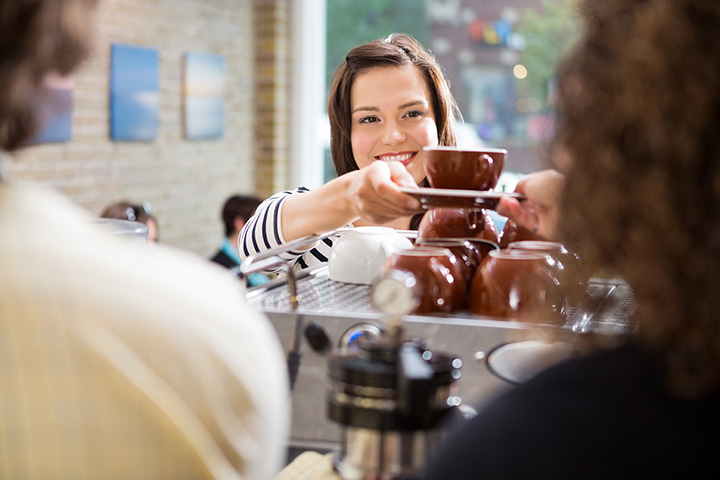 A coffee shop should be more than a place where you fill up on your daily dose of caffeine. It's a neighborhood hangout, the place you can see your friends, an atmosphere that's warm and friendly, and makes you want to stay a while. The best types of coffee shops do this to us and in Maryland we have plenty. Whether you are an art aficionado, enjoy live music, want the absolute best dessert in town, or want your coffee to be locally roasted using fair-trade beans, Maryland has a coffee shop for you. Here are our 10 favorites. Spoons in Baltimore got an award for being the best kid-friendly restaurant in the city. They were also voted the best coffeehouse in Baltimore. This place is seriously yummy. They roast all of their coffee at their shop and everything is made from scratch. This means fresh scratch-made biscuits, breakfast like your grandma made, and even lunch food that tastes absolutely scrumptious paired with your favorite type of coffee. You can't go wrong at Spoons and you're definitely going to want to come back. Ceremony coffee in Annapolis is all about flavor. In the fall they feature blends rich with honey and cinnamon and you can expect unique flavors that mirror the seasons in addition to their staples. They have a coffeehouse in Mount Vernon, Annapolis, when will open soon in Baltimore. If you are looking for a local roaster that focuses on robust flavors, visit Ceremony's coffee shops. For the perfect combination of coffee and award-winning food visit Artifact Coffee and sister restaurant Woodberry Kitchen in Baltimore. In 2015 chef Spike Gjerde received a James Beard Award, Baltimore’s first. Artifact has fun events like bowl and a beer night along with a weekend brunch that is absolutely fabulous. Korean food and coffee–it may sound like an unusual combination but it absolutely works at Dooby’s. Stop by for a sweet Korean iced coffee that is made using condensed milk and then order some kimchi potato salad for lunch. Your taste buds will thank you. Locals, activists, artists, students and politicians are all likely to be found at 49 West. This is a true melting pot in the center of Annapolis and the vibe is welcoming to all. Stop in for a steaming hot cup of coffee, delicious pastries, salad or dinner and then stay to listen to a variety of local bands or enjoy the art filling the walls. You can even order a glass of wine if you are in the mood for something stronger than your favorite latté. Located in Sykesville, the French Twist Café has old-fashioned Maryland charm and is located in traditional style farmhouse. The food and coffee, however, is more reminiscent of a Parisian street café. Here you can taste delicious French crepes while drinking gourmet coffee. Bean Hollow is among the very best coffee shops in the state. The shop was voted the best of Howard County for two years in a row. The variety of high quality coffee and sweet treats are enough to keep you coming back, but the warm and welcoming staff tops off the experience. Support Bean Hollow as they rebuild your favorite local coffee shop after a recent flood. Go Italian and head to this authentic Italian espresso bar. Located in Rockville, CremCafe provides guests with Italian espresso and cappuccino that can be paired with warm pastries and lunch made using the freshest ingredients. Try their prosciutto salad with basil, mozzarella, cherry tomatoes, parmesan and prosciutto, close your eyes and you may as well be sitting in a café and Rome. It’s transformative. For 15 years, Dublin Roasters Coffee has been honing the art of coffee roasting in Frederick, Maryland. While they serve breakfast and lunch, their coffee is the real star of the show. What’s really cool about Dublin is that they have a large space and also hosts events. For example, you can join them for yoga every Monday and then stay to have a cup of coffee with your friends. Organic and fair trade beans are used by Vigilante Coffee Company to craft artisanal java. Located in an industrial space, this is the perfect space to meet up with a group of friends, sit at one of their outdoor tables, and enjoy a beautiful day while sipping something absolutely fragrant. Stay a while longer and enjoy a fabulous desert while you’re at it. You can’t go wrong with our top ten list so happy drinking!